SANA'A, 20 January 2015 (IRIN) - Muneer Asharby nearly didn’t go to work today. It wasn’t until after noon that he finally braved the walk. Even so, he kept half of his hardware shop closed in case he needed to make a fast exit. The day before a mortar shell landed just in front of his shop, in the southern part of the Yemeni capital Sana’a. Asharby’s Beit Al-Abatan neighbourhood sits in the shadows of a hill now under control of the Houthi rebel group from northern Yemen. They had been battling with government forces for two days, with both sides showing little concern for the civilian population. “They [are] fighting for the chair,” he said, referring to the president’s seat. Mid-afternoon, the gunshots again rang out across the city, but this time the outcome was more decisive. After brief clashes, Houthi fighters had stormed the presidential palace with relatively little bloodshed. Shortly after, the house of President Abd Rabbu Mansour Hadi came under attack. Had the "chair" been toppled? It is not immediately clear if Hadi remains in power, but the Arab’s world’s poorest country has undoubtedly been again thrown into chaos. 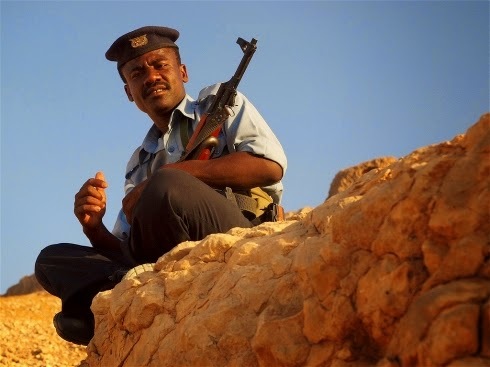 Since late summer, the Houthis – made up of predominately Zaidi Shiite Muslims – have gradually increased their influence and reach, with the support of others – including, allegedly, former President Ali Abdullah Saleh, who was deposed in 2011 after popular protests. In September, they claimed control of much of the capital, initially stressing they were not seeking to depose Hadi. Yet in recent days they have made another power play, with government forces pegged back by the well-armed militia. “The Houthi strategy is to take over Yemen slowly – shock and then stop, shock and then stop,” Said Farea al-Muslimi, visiting scholar at the Carnegie Middle East Center. The Houthi takeover came after a ten-month National Dialogue Conference (NDC) failed to produce a clear consensus on the future of the country. The NDC - a product of the 2011 revolution - aimed to prevent the state from fracturing further. But Yemen has instead been increasingly embroiled in regional and sectarian polarization. Al-Muslimi expects the Houthi takeover of the presidential palace to lead to more violence. In recent months, al-Qaeda in the Arabian Peninsula (AQAP) – the militant group’s Yemeni faction – has carried out a series of suicide bombings in Sana’a, attacking Houthi targets. “It is worse than a [military] coup because it will increase the state of chaos,” al-Muslimi said. This is the latest chapter in the ongoing story of Yemen’s unraveling: the government and aligned tribes have been battling the Houthis in the north on-and-off for more than a decade; AQAP is active in Yemen’s south, provoking regular US drone strikes; a southern secessionist movement has been gaining strength; and after street clashes and political manipulation, Yemen’s version of the Arab Spring led to an unstable political transition – never completed - that has now been thrown into question. According to the UN Office for Coordination of Humanitarian Affairs (OCHA), close to 16 million people in Yemen - more than half the population - will need humanitarian aid in 2015, of whom eight million are children. More than 330,000 Yemenis are already displaced within the country due to pockets of conflict in both the north and south. Around the Nahdayn hills that oversee the presidential palace, evidence of the more recent battles is clear: buildings hit with heavy artillery, others pockmarked by bullet holes. One resident pointed to a gaping hole in his gate caused by the crossfire. “Everyone is armed. You see weapons everywhere. How can you feel safe?” said an employee at a construction company who did not want to share his name. Speaking in whispers, he said the violence has made old friends lose trust in one another. “Everyone is lying. You don’t know whom to believe,” said 26-year-old civil servant Ali Abdulla. “It should be the government that is protecting us,” he added, disparaging the lack of government presence nearby to provide a sense of safety. Trond Jensen, head of the UN Office for Coordination of Humanitarian Affairs in Yemen, said that the humanitarian impact had so far been relatively limited, but added: “We are concerned about the protection of civilians and ensuring civilian infrastructure is not damaged.” In particular, he highlighted the threat of hospitals and schools being hit during battles, with reports of one hospital having been damaged. Up to a few hundred families have been displaced by the fighting, predominantly in the more affluent southern part of the city, Jensen said, stressing the numbers were not yet clear. Yemen suffers from chronic poverty, with among the highest rates of malnutrition and stunting in the world. The political turmoil over the last few years had already made it harder for aid organisations to support those in need; this latest development will only make aid delivery even more difficult. Until unification in 1990, the Yemen Arab Republic (North Yemen) and the People’s Democratic Republic of Yemen (South Yemen) were two separate countries. Some have now raised concerns of a new split.